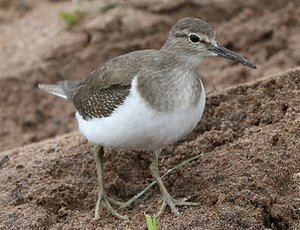 In winter the Common Sandpiper has dark brown upperparts, it's breast is streaked brown on either side, and pale in the middle. It's underparts are clean white. The summer plumage is very similar except the breast is more brown, although there is always a pale patch in the middle. 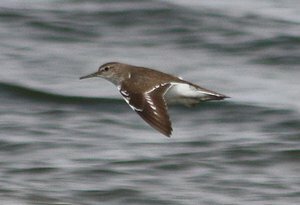 The Common Sandpiper is most often seen when flushed from the waterside, flying low over the water with stiff shallow wing beats. When feeding it has an almost constant, distinctive tail bobbing motion. Note the pale feathers in the middle of the breast, also note the greenish legs and distinctive eye ring with eye stripe. 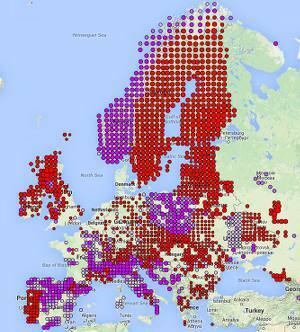 Breeds throughout most of Europe where it also winters, however some go further south to winter, some even as far as New Zealand. Breeds in a variety of habitats but always near water, including streams, lakes and sheltered estuaries. On migration or when wintering, it can be found near almost any water, although it does tend to avoid concentrations of other waders. Common Sandpiper: Note the distinctive bobbing motion. 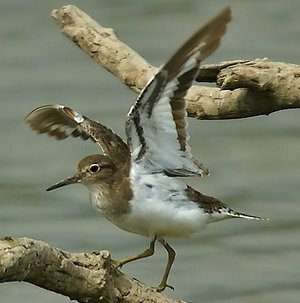 The underwing of the Common Sandpiper has distinctive white and brown bars, although they vary it is an unusual feature in waders. 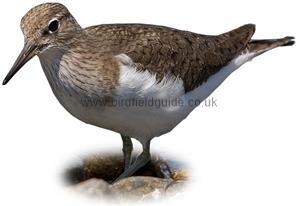 The Common Sandpiper in flight has fine white wing bars and white around the edging of the tail.